WE MUST MAKE "BOOGIE MUSIC" THE ESSENTIAL FACTOR IN THE LIFE OF ALL. 1755 – Samuel Johnson's A Dictionary of the English Language was published. 1817 – Thomas Hopkins Gallaudet and Laurent Clerc founded the American School for the Deaf. 1865 – President Abraham Lincoln died. 1892 – The General Electric Company was formed. 1924 – Rand McNally published its first road atlas. 1936 – The Arab revolt in occupied, misnamed "Mandatory" Palestine began. 1945 – Bergen-Belsen was liberated. 1960 – Ella Baker led a conference that led to the creation of SNCC. 1994 – The Marrakesh Agreement rcreating the WTO was adopted, further empowering corporations and corporatists. 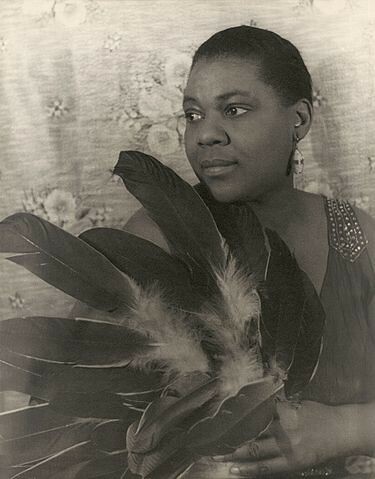 Honoring Bessie Smith this fine day. Love her music. It's tax day ~ although I had to pay, it wasn't much and I'd rather use my money and pay than let them use my money interest free! Have a lovely start to your week, everyone! Tax day is for folks like you and me. Corporations on a calendar year not filing n extension file in March but most have fiscal years and file extensions. Most wealthy also routinely file extensions. If you can owe them, but not enough to incur penalties, owing them is financially wisest, but interest rates these days are laughable, so the financial gain is minimal. Just on some news unrelated to the American election: an update on the Panama Papers scandal. It caused some moderate hoopla in Canada, and the Canada Revenue Agency (our IRS) sprung into action. I was glad to read too that other countries are also getting theirs and holding tax dodgers accountable. Good morning Frog, thanks. Thanks for the link, too. and the details don't matter, except to those who were paying enough attention to catch the lies about her statements early on. Thanks for all her songs that you featured. a cool idea, too bad it is going away. Thanks for the music. TO me, "low post" is a description of a group of basketball plays. Thanks, el. What a great way to start the day! Leonardo di Caprio is a wonderful name for a modern actor, no? From What's Eating Gilbert Grape on, I think Leo d C is an underrated actor. Then again, I'm no film critic. I don't think that Leo Da V. appeared in The Medicis, as did other famous Italian artists of yore whose patrons were the Medicis. Well, actors portraying them appeared. Show business being what it is, the actor in the series who portrayed Lorenzo de' Medici, aka Lorenzo the Great (another great name, literally) is, IMO, the best-looking actor in the series, even though Lorenzo was famous for not being handsome, as well as for his greatness. In that the surname Joplin reminds me of composer Scott Joplin, aka the King of Ragtime, I think it a fine surname for a singer. Especially one like Janis Joplin who, at a young age, paid homage to her musical roots/heritage. You could also look at their patronage of the arts as a way to demonstrate their wealth and power. Just as their family emblem was strategically placed throughout the city of Florence, the art work that they supported was primarily showcased inside Italy's churches. Interesting to think of artists now and then. Now, an artist creates their artwork and then tries to find a buyer. During the Renaissance, an artist needed a patron, or a buyer (usually the Church) to commission the artwork before the artwork began. My favorite story of that time was when the Pope Julius II commissioned Michelangelo to paint the Sistine Chapel. While Michelangelo's early training was as a fresco painter, his true love was sculpting. Lifespans being typically short during that period, Michelangelo was concerned how many years he had to create a body of sculpting work. The Sistine Chapel took ten years of his artistic life to complete. Ironically the artwork Michelangelo was most keen in creating was sculpting the Pope's Tomb. Of course when I say "Tomb" I am not referring to the modern day version. The sketches Michelangelo did for Pope Julius II Tomb were the size of a small house and quite extravagant. Chomping at the bit to begin the work on the Pope's Tomb (which would have been quite a prestigious commission at that time as opposed to painting the vault of a chapel), Michelangelo was devastated when Pope Julius instead asked him, and finally had to threaten Michelangelo with ex-communication, to paint the Sistine Chapel. If you look closely at the figures on the Sistine Chapel, you will see how Michelangelo incorporated his sketches of the Popes Tomb on the ceiling. Essentially "sculpting" the artwork. Every time I visit the Sistine Chapel, I think about Michelangelo's true love, his sculpting, and wonder how he would feel to be best known for the wonder and beauty that is the Sistine Chapel, and then I tear up at the poignant irony of his immense achievement. Who could tell a good story, and Michelangelo was her favorite subject. My benefit. Never missed a class. and then, but not much. Being a patron of the arts is one of those things that has merit in its own right, but is too often funded by ill gotten gains. A dilemma if there ever was one. Thanks for the tunes,especially both versions of Black Mountain Blues. I've always liked both versions, and Scott Joplin, of course. XR is doing it. 33k by their estimate. has now come out with a statement backing Assange, saying Germany should offer him political asylum. So now it’s both “extremes” (the Left / Die Linke and the AfD) against the silence of the multi-party Atlanticist-captured center and center-lefters. Of course there’s no chance of Merkel or the Social Democrats in the ruling coalition doing any such thing. In that sense the stance of the Left and AfD parties could be dismissed as empty posturing by the opposition without any actual consequences. I still think it’s the right thing to do. parties are espousing Assange's cause, though, of course, no NTO central government is remotely likely to. Thanks for hosting today's OT, and honoring a very wonderful singer. What a lovely talent to have. A singing voice. Tax day and my eyes are still bleary from peering at the teeny tiny print on the new 1040 tax form, which is now only have a sheet, God knows why. And for reasons that are too complicated to go into, I cannot file my taxes on-line, which means I still have to get my State Tax form printed out and do that. Ugh. What an odious task. Apologies for being such a bummer. But why, oh, why, does this process have to be so awful!?! Here's hoping everyone else has a better day! years ago we arranged to generally have excess withholding. That means that we set a small refund for spending on our spring trip, which gives me an incentive to crank out the returns as soon as I can in January or February, giving me a wonderful feeling of freedom as April nears. Happy to provide the OT, wish they were all this easy, simply find and highlight a fabulous talent. Bonus, I get to listen to a lot of it while selecting videos. Thanks for reading and have a great one. I typically like to get a jump on things and not wait until the last moment. But not with this. Big mental block I suppose. And when it's over, I put it completely and as far away in my mind as I can. Until, the next year. A bit illogical, I know. But something inside me just doesn't want to give the treasury my money until the last possible moment. Hence my yearly ritual of gnashing my teeth.